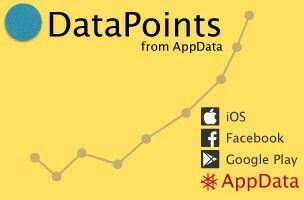 DataPoint: Is Social Point the Next Big Game Developer? The social gaming space is dominated by King and Zynga. As we recently discussed, King’s games alone take up a quarter of the Facebook app market. However, the Barcelona-based Social Point has been growing steadily, and its numbers are nothing to sneeze at. The developer boasts over 38.5 million MAUs on the platform, an increase of 172 percent year-over-year. DAUs are at almost 7.8 million, up 283 percent year-over-year. DAU/MAU engagement has increased almost 6 percent year-over-year, showing that more users are playing one of Social Point’s games on a daily basis. The company recently announced a shift in strategy. In an effort to create games that have longer lasting appeal, the company has four new games in the works that will be “mobile action social strategy” games rather than “breeding” games like Dragon City. The first one, “League of Warriors,” is set to launch this spring. The company has doubled its workforce in the past year and its revenues have increased 10-fold in the past two years. Even though Social Point’s revenues are a fraction of King and Zynga’s, the company’s growth makes it a strong contender for the next big thing in social gaming.